Some may feel comfortable that the Democrats do not dominate the White House, Senate or House. They may thus feel their gun rights are secure. However - with the latest mass shooting at Stoneman Douglas High School - this sense of security may be false, if not foolish, for the liberal, "Get-Trump," Mainstream Media is going after guns more viciously than ever. They're even enlisting the Kids of America - brainwashed by the Frankfurt School's "long march" - to help out with the proposed new infringements. And indeed, the Kids of America ARE on the "long march" - including all over Washington DC. They're coming for their parents guns, YOUR guns. And they have a longer amount of time to do it because they have more years left to live. So do the math. At the massive, Hollywood-managed, anti-Gun rally in DC - and across America - the Gun-control Lobby's mantra was spelled out out by Martin Luther King' granddaughter who stated before millions on network TV: "I want to see a world with no guns ... so how do we have a gun-free world?" Given this, it's disheartening that millions of Kids across America have been well-trained by Foundations and the Frankfurt School's "long march through the cultural institutions." 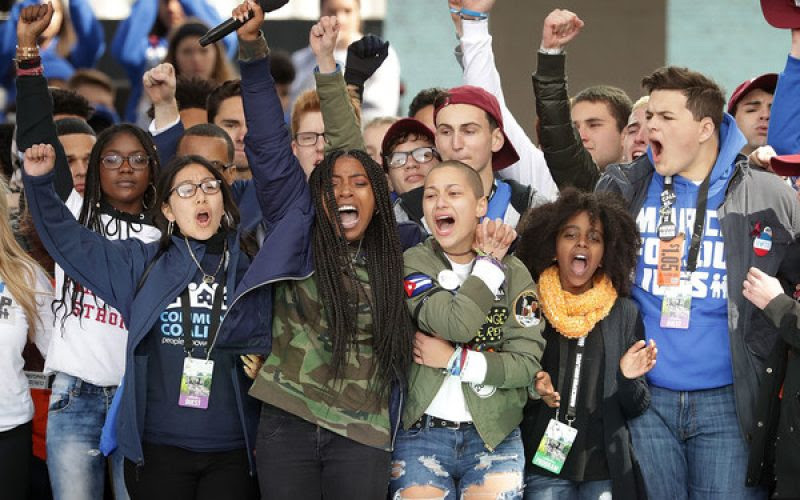 The kids sure displayed their marching abilities at the march in D.C.
Of course we covered the "long march" years ago in a movie entitled, CULTURAL MARXISM - The Corruption of America. But since the Mainstream Media is controlled by basically the same demographic as the Frankfurt School - we were assured there was no "long march" in the past, and there would be no "long march" in the future. So the movie was blacklisted by the MSM. One hundred years earlier we were also assured that "the workers of the world would unite" under Marxism. Ironically, there has been a twist in the plot: the "workers of the world" have united under the Republican's Trump and the Kids of the World have united under the Democrat's Gun-Control Lobby. So it looks like the $4.3 million budget the studios, progressives and collectivists allocated to Michael Moore to produce the kid-friendly movie, BOWLING FOR COLUMBINE, is really paying off. Of course many conservatives - being excellent at conserving not only Constitutional principles, but money - left it all to God to fund and produce THEIR kid-friendly movies. Unfortunatley God was busy on other productions, so none were made. Way to go fellow conservatives! You stood by your faith that God, Michael Moore and the MPAA studios would sort everything out. And they did. Hope you are happy with His choices and hope the collective has mercy on your individual souls." For now the millions of BOWLING FOR COLUMBINE-educated Kids are out to turn the world into a massive "gun-free zone" as Martin Luther King's grand daughter, Yolanda, postulates. Maybe this is for the best. A gun-free world where only selected elites in Washington DC and in our local police forces keep and bear. In such a world, we can at least be sure the kids in the nation's high schools will be safe from AK-47s. At least AK-47s in the hands of other kids. Someone should make a movie budgeted at $77,467. It could be called GOOD GUYS WITH GUNS - How the Second Amendment Can Stop Mass Shootings. As mentioned, someone already made a movie budgeted at $4,300,000. It was called BOWLING FOR COLUMBINE, about how gun-free zones can stop mass shootings. Maybe if the Kids of America were presented a choice, they would choose more wisely. All factiousness aside, your generous donations from the past Progress Report indicate that you DO want to make GOOD GUYS WITH GUNS and I am happy to be able to report this. Unfortunately we still do not have the budget necessary to conduct the 10 or so interviews lined up. Your donations from have however made it possible for us to send a camera crew out to interview G. Edward Griffin, so thank you very much for making this possible. Also, we should be able to do yet another draft of the script thanks to the donations that have been allocated. The new draft will incorporate the many great suggestions you sent in regarding the 14 points on how to remedy the mass shootings. With your help, we have now assembled possibly the most comprehensive list of remedies to the mass shooting problem ever assembled and all this will be incorporated into the movie. Lastly, we may be able to produce a new trailer but please watch the current trailer below and donate what you can to keep this effort alive. GOOD GUYS WITH GUNS explores mass-shooting at schools, churches and public places and seeks solutions. Statistical data tells us that 70% of the time it takes the police about 11 minutes to get to shootings, but they are over in about 5 minutes. Then, predictably the same "gun-control" lobby comes out and advocates yet more regulations, more limits on arms, more "gun-free zones" and other infringements of the Second Amendment. GOOD GUYS WITH GUNS explores the reasons the Founding Fathers did not want infringements on the arms and why they gave WE THE PEOPLE a means of protecting ourselves, not just through the "individual right to keep and bear arms," but through "good guys with guns" - what they called "well regulated Militia." Inspired by the works of Edwin Vieira, Jr., author of Thirteen Words, The Sword and Sovereignty and By Tyranny Out of Necessity, the documentary is a Matrix Production in association with OATH KEEPERS. Unless the American public better understands how and why mass shootings occur, we will never be able to eliminate these atrocities. Watch this clip on Cultural Marxism to better understand how the Kids have been brain-washed into to marching in DC. There is a very good chance GOOD GUYS WITH GUNS - How the Second Amendment Can Stop Mass Shootings will have a positive effect on Society. These films ARE making a difference. Verify my claim by watching the past productions and see if they don't match up to many of the improvements we see happening right now. All of our movies are public service projects and the evidence shows that we ARE making a difference. 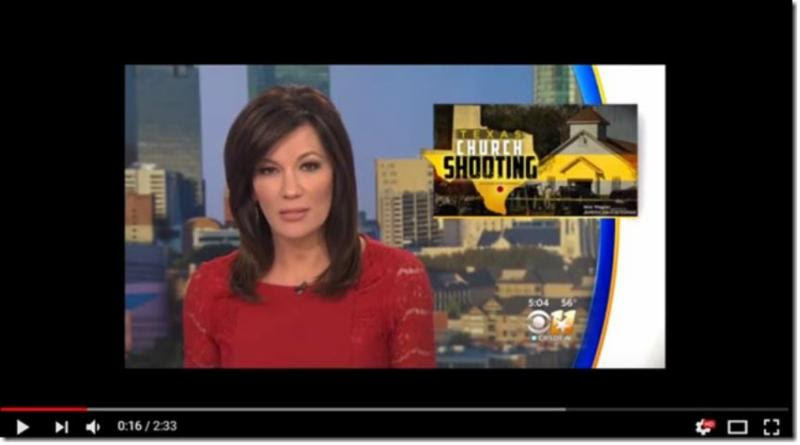 The Mainstream Media - as we discussed in our previous production of MAINSTREAM - has become corrupted and now works to indoctrinate WE THE PEOPLE into an acceptance of an anti-Second Amendment culture and the Globalist Agenda. Help stop this. Please go to www.Good-Guys.us/donate and donate whatever you can even if it's $100, $50 or $25. Producer and Production Associate screen credits will be granted as acknowledgement for your donations. Also there is still a prominent Producer, Executive Producer and Associate Producer screen credit available in the MAIN titles of the film. See the donation page for details. Thank you for reading this and contributing what you can. A "free state" and "a more perfect union" are made possible by men and women who care. Thus, if even 10% of the thousands of you reading this now show they care by donating, we will get the interviews completed and finish the documentary. Its release may help stop these horrific mass shootings. Isn't it worth a try? P.S. Please forward this Progress Report to your family, friends and associates. The more people who know about this production, the faster it will get done. Thank you. Thanks for posting this. Movies are influential on many people, especially kids. Whew, what a wild wild imagination you have ! "I want to see a world without guns." You can start with all the armies, alphabet agencies, secret service, municipal and territorial law enforcement agencies. LOL...how are my fellow human beings this stupid? Dense. Unaware. The right to self-defense using equal means of lethal force to the rabid pirates and criminals -- either in our public offices or just out on the street -- is a fundamental, unalienable, God-given one. Even the good ETs have anti-matter weapons at the ready -- likely, especially charged-up for their Earth trips. 1FreeMan, is there a time limit for using the 843 for refunds? The HR Block people stated refunds must be requested within 3 yrs. of original tax filing of the 1040.
why are you asking a question on your tax issues on this thread? You would be the first to complain if some one else did? Besides, why don't you ask Jesus? His line busy? In the twentieth century, America's Boy Scouts were PREPARED. If you could not earn a firearm merit badge, you could wear a skirt and sell Girl Scout Cookies. I think Barry Soetoro sold a lot of Thin Mints. Question: What authority does the IRS have to just turn those Refunds over to the DoE....with no notification or advance notice to the tax payer and without any court order of any kind.? And does the tax payer have a remedy or a legitimate rebuttal to this 'robbery'?